Sometimes it’s good to take a morning away . . . away from the office, away from the desk, away from the computer. Tuesday morning, I did just that. 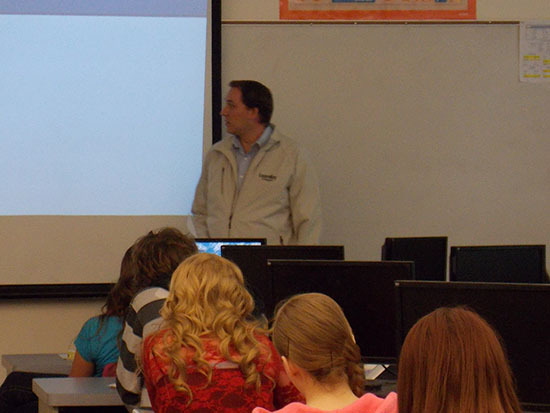 I took a morning away from LearnKey to speak to the Web Design class at Parowan High School in Parowan, Utah. My wife is a student teacher at Parowan High School, and when her mentor teacher learned that I work as a Web Designer she asked if I would be willing to come talk to the class. She wanted someone in the local community to give her students a “real world” perspective on the concepts they are studying in class. The world tells us that we can become anything we want to be. Therefore, the world tells us that anyone can become a web designer. The world often fails to mention that while everyone can become a web designer, not everyone will become a good web designer. Like any other profession, to become a good web designer a person must put in a lot of hard work and dedication (a little bit of natural artistic talent doesn’t hurt either). As an artistic professional (yes, web design is an art form), I can’t always remember the fundamentals of designing a good website. As in many other professions, the elements of good design became instinctual over time and I subconsciously implement them in every design I create. As a result, I had to re-learn the proper terms for things that have become second nature to me. I had to re-educate myself before I could properly give a presentation on the elements of a good design. LearnKey’s Web Site Design Course provides a great introduction to these important concepts and teaches students how to use the tools necessary to succeed in a web design career. Education is a large part of what it takes to succeed in any field of employment. Even so, with the large number of people looking for work, a proper education may not be enough to set you apart from other job seekers. It’s the seemingly simple things that set candidates apart, things like extra training and industry certifications. At LearnKey, we understand the need to rise above the competition. Many of our courses are geared toward preparing students for certification, whether they’re interested in the Adobe Creative Suite, Microsoft Office, or CompTIA’s A+ Certification. Our primary goal is to provide quality expert-led training that will enable students to get certified at a pace that works for them. LearnKey’s courseware is carefully mapped to exam objectives, with project manuals and practice tests to reinforce concepts taught in the training. I guess even on my morning away I couldn’t stay away from LearnKey or its mission. Thanks again to Deveny Pace and Nicole Washburn for allowing me to take up their valuable class time. I recently read an article titled “8 Second Careers to Consider.” In a nutshell, the article is for people who are considering a second career and aspects of changing a career that need to be addressed before they make the change. The part of the article that caught my attention was a section that talked about making sure you have the necessary skill set for the new career you want to start. One important step is to evaluate which of your current skills can transfer from your old job to your desired job; also what skills you need to develop to ensure you will be successful in your new career. I found that LearnKey has courseware that will prepare job seekers for three of the careers listed in the article. I would like to take a minute to explain how our LearnKey offerings coupled with previous work experience can provide you with some of the necessary skills you need to be successful in one of these three careers. Market Research Analyst – Study market conditions in local, regional or national areas to examine potential sales of a product or service. They help companies understand what products people want, who will buy them and at what price. Choose from individual courses or use our career and certification paths to guide you to a success career in the market research field. Meeting, Convention, and Event Planners – Coordinate all aspects of professional meeting and events. They choose meeting locations, arrange transportation and coordinate other details. Choose from individual courses or use our career and certification paths to guide you to a successful career in the meeting, convention, and event planning field. Secretaries and Administrative Assistants – Perform routine clerical and organizational tasks. They organize files, draft messages, schedule appointments and support other staff. Choose from individual courses or use our career and certification paths to guide you to a successful career as a secretary or administrative assistant. Changing careers can be a scary and stressful step in life. I believe that LearnKey offers the best in educational video courseware and will provide job seekers with the skills foundation they need to be successful in their chosen career. I am excited to announce that LearnKey courseware has been approved by the New York State Department of Labor and been added to the Eligible Training Provider List. The purpose of the Eligible Training Provider List is to provide community members with a central list of a broad range of training options that are available in communities throughout the state of New York. Inclusion in the New York State Eligible Training Provider List required LearnKey to submit all courses to the New York State Department of Labor to make sure it complied with their high standards. Being added to the list puts LearnKey into a broad pool of training providers, who are in support of the training and employment goals of the individuals who access the list. Challenges are part of any industry. Sometimes those challenges are overcome, sometimes they prove to be too much, and sometimes a challenge is simply ignored in the hope that it will somehow disappear. Personally, I love a good challenge. Many of the challenges I face in my work, through sheer repetition, have become routine—finding an expert, scheduling an expert, acquiring exam objectives, appropriately timing a release, etc. It’s not that these are no longer challenges for me; it’s more that experience has taught me effective mechanisms with which to respond to each. If you’ve read the two previous blog posts regarding LearnKey and the Common Core State Standards you know that, at least initially, I was hoping to sidestep the challenge of aligning LearnKey courseware to the core standards; I wanted it to “somehow disappear,” I didn’t see it as a good challenge. However, you may have also noticed that while I was trying to dodge this particular challenge I was (perhaps unknowingly) figuring out how to process it into manageable bits. The previous posts, as one commenter noted, were a bit of a tease…you could even argue that this post (so far) is continuing that theme…it is. Yet I felt it was important to show that there was thought and purpose behind what we hope to accomplish as we demonstrate our alignment to the Common Core. I do not consider myself an educator. I am a technology-minded instructional designer who also happens to be a dreamer. I love research and collaboration. I love to find ways to help people succeed. I love making things better. This is exactly what aligning LearnKey courseware to the core will do; it will make it better. So here’s the big reveal; new LearnKey course maps will not only show the course index and corresponding location of exam objectives, they will now indicate which sections of the course align to the Common Core State Standards and offer suggestions on how to apply the course material to satisfy the standard. In addition to the detailed mapping, LearnKey Project Manuals will also indicate how the projects are core aligned. In the coming weeks LearnKey will release the Photoshop CS6 (4/1), Dreamweaver CS6 (4/15), Premiere CS6 (5/6), and InDesign CS6 (5/20) core mapping documents; followed by Word (6/3), Excel (6/17), and PowerPoint (7/8) (2013 versions). Our new Adobe CC course offerings, coming later this year, will include the updated mapping as part of the project release. The upcoming Photoshop CS6 document shows areas of alignment with the Common Core State Standards in English Language Arts. As more of the maps are generated we will create a “reverse” mapping document—one where the standards are the anchor—that will show all of the courses that can be used to satisfy any particular core standard. Working to create these mapping documents is a challenge my team and I eagerly accept. I work with educators on a daily basis. I recognize the frustrations, challenges, and concerns that they face. I know that a map won’t solve every problem, but I do know that it will provide a direction and offer a solution. Quick on the heels of our Certified Associate in Project Management® 2014 Certification Prep Course, I am excited to announce that our Project Management Professional® 2014 Certification Prep course has been released, joining CAPM as the second course to be added to our Project Management prep courses. We are excited to be able to offer both of these courses to those seeking a certification in Project Management. As a globally recognized certification, this certification is perfect for managers who have experience and have demonstrated the ability to successfully lead project teams. With LearnKey’s Project Management Professional (PMP) course users will prepare for the PMP exam based on the 5th edition PMBOK® Guide. This course guides you through the journey of understanding the basic fundamentals involved in high-level project management. Discover what defines a project life cycle, how project management process mapping works, and how to develop a project scope statement. Project Management Professional® is a registered trademark of Project Management Institute, Inc. The release of our Certified Associate in Project Management® Certification Prep Course represents the culmination of the planning and work that has gone into creating this course that started over a year ago. Our new CAPM prep course is LearnKey’s first fundamental certification in Project Management. Obtaining the Certified Associate in Project Management (CAPM) certification is a good fit for those who are new to project management and looking for an entry-level certification or those who are still trying to find direction in their career. Get prepared for your CAPM certification with the Certified Associate in Project Management course. This course will improve your understanding of the terminology, basic knowledge, and process of effective project management. I live and breathe exam objectives; whether they are Adobe, CompTIA, Cisco, Microsoft, or others it is part of my job to ensure that our experts and our production team are working from the most recent version of the objectives for any given certification. I am a big fan of efficiency as well, so I don’t like reproducing material unless it is necessary; but I also understand that sometimes a Cisco networking objective and a CompTIA networking objective might not line up 100%. So, in general if we decide to repurpose any existing content we try to keep it within the same certification family. My first exposure to the Common Core State Standards was from this “objective” perspective, and quite honestly it terrified me. Our sales staff was being asked about our alignment with the core and they approached it from the same direction—how does our existing content meet the objectives of the core? I recall our initial strategy calls all ending with the action of “our courses need to map to the core.” This presented me with a personal quandary; I knew (somehow even before I had actually read the standards) that there was no way I could take an existing LearnKey course and remap it to a new set of objectives. That isn’t how it is done! We only move content around within a certification family—Microsoft within Microsoft, Adobe within Adobe; and here I was being asked to add a different standard—the Core—to my neat and tidy organization. Undoubtedly the objectives for the Core would be in a different order than any of our existing objective standards; the language would be different; the goal would be different. Honestly, as much value as I knew it would bring, I wasn’t sure I wanted to be a part of the Core. Flash back to my Saturday repairing a roof with my teacher friend. “What have you read?” he asked. I of course launched into the numerous opinions and responses that I had unearthed. He listened for a moment and then said, “You realize you haven’t actually said anything about the core yet, right?” I stopped. He was right. What I had read was more about the Common Core and not the core standards themselves—of course I had breezed through them, but being blinded by my “objective” perspective I only saw them as having a similar format, structure, and organization to the objectives that I was so familiar with. I spent a furious evening re-reading the actual standards. There was the answer I was looking for—in numerous places I was reading “Common Core State Standards.” That was the discovery that was looming in front of me the entire time. The Common Core Standards aren’t objectives, at least not in the way I was used to working. We build a course and make sure our experts, assessments, and manuals explain the objectives and give practical experience where possible. They’re bite size pieces that when mixed together yield certification. The Common Core is a different recipe. The standards aren’t about understanding a piece of information; they’re about demonstrating ability. It was a simple discovery. To align LearnKey’s content to the Common Core would only require taking larger pieces of our existing material and demonstrate how it shows the ability required by the standard. Instead of forcing a retrofit it would actually bring multiple families of LearnKey content together under one umbrella—the educator has the ability to choose whether they want to use Adobe, or Microsoft, or any of our content to satisfy the same standard…all we have to do is show them which pieces fit where, and that’s what we’re going to do. Editor’s note: This post is introducing a series written by our Director of Content Development, Wyett Ihler. As the Director of Content development, his main responsibilities are to select which course titles LearnKey will be producing during the year, find authors for each course, and assure that we have the most current test objectives from certification vendors. Over the next three weeks Wyett will be writing a three-part series of blogs, sharing what he has learned in his quest to understand one question: Is LearnKey aligned with the Common Core State Standards? There’s always a bit of adrenaline that accompanies a call from your company’s CEO—that, “Will I be up for whatever will be asked” jolt that comes from seeing his name pop up on the caller ID. He asked what seemed like a perfectly innocuous question, and in retrospect it was, but the simple, “Are we aligned with the Common Core State Standards?” truly lead me down the road less traveled. I am a parent of two school-aged daughters and I knew some about the Common Core State Standards; I freely admit I didn’t know everything (not even close! ), but I had read the literature provided by their school regarding their adoption methods and was satisfied with the information I had. However, when I was asked to assess LearnKey’s level of alignment I found myself telling my CEO that I needed to understand the Core better before making an assessment. The first step of my search was to find my way through the vast amount of information available regarding the Core. A simple “Common Core” search in Google yields far more results than anyone would have time to sift through. There are a lot of opinions about the Core, and some very passionate responses both for and against, but none of this information was helping me to answer my CEO’s question. Further complicating my search was the fact that in addition to the National Standards, many (I haven’t read enough yet to determine if all) states have state-level implementation standards. On top of the National and State Standards for K-12 there are the technical core standards adopted in many areas and by many LearnKey clients; everywhere I looked there were more standards, more cores and seemingly none of it had anything in common. My search was piling up around me and ultimately leading nowhere. The second step (yes, I had yet to go beyond step one) was the step that actually set me in the right direction. A chance Saturday meeting with a teacher friend of mine while re-roofing a garage helped me see pass the mountains of data I had so quickly accumulated. We were hauling materials from the truck to the ladder when he asked me how work was going. I grunted, not really wanting to talk about it, and then said that I was working on understanding the Common Core. “Good luck,” he laughed, but then asked more questions about what I was trying to do—and with the practiced patience of a teacher he guided me to the answer that was right in front of me just waiting to be discovered. I was making it too hard; the Core is relatively straightforward and is, in LearnKey’s case, just waiting to be applied. 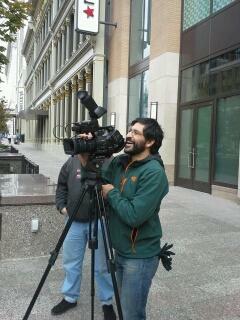 Ditching the studio and taking the cameras, talent, and crew out on location is a good change of pace. There is just something to be said for being outside and filming and being surrounded by people, fast moving passenger trains, and loud cars. Filming on the green gives you the flexibility to create any environment you need. However, there are times when the green screen can’t give you everything you want and that’s when you step outside and shoot on location. LearnKey took the crew on location to film headshots for our upcoming Project Management Professional course featuring the work of Michael Solomon. After a few different site surveys the crew settled on filming on an empty building lot just above the Salt Lake City Capitol as well as filming on Main Street. 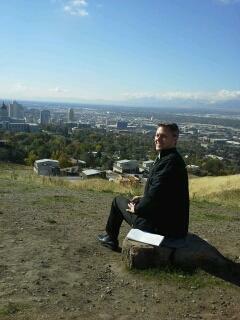 Both of these locations placed our author in the perfect environment for this business professional course. How well you have prepared and packed your equipment can make or break your shoot, and Mother Nature can put a stop to any and all filming you have planned as well. Luckily for us, we were packed, prepared, and the weather unfolded perfectly on our day out of the studio. We set up both of our cameras, pinned on the wireless mic, while pointing two reflectors perfectly on the talent. Michael Solomon was well prepared and as soon as the cameras were rolling so was he. 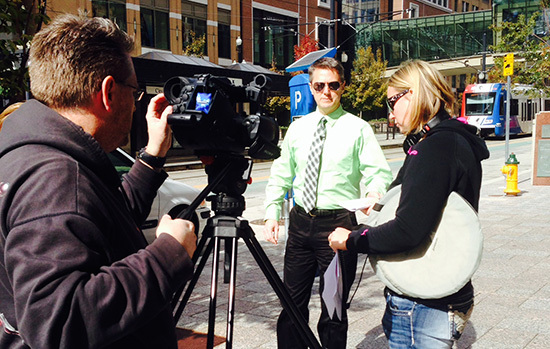 We were able to shoot all of the headshots in one day at two different locations. Life is good, when you can take the crew out on location and get the shots you need in the time that you have and that’s what the crew was able to do this time around. Honestly, we are now looking for more ways to get out and shoot on location. What is your professional and military background? Active Army from 5/17/2007 to 12/5/2013 stationed at Joint Base Lewis-McChord in Washington state. I was a Wheel Vehicle Mechanic and Maintenance shop foreman/supervisor. I worked mainly on Diesel equipment as well as rocket launchers and field artillery equipment. I was medically discharged and retired as a SGT. After two weeks on the job what do you like most about it? My favorite part about this job is working with Veterans. I can relate to them on a personal level. What is your favorite type of food? My favorite type of food is Mexican food. If you could go anywhere in the world where would it be? If I could go anywhere in the world, I would want to go to Italy to sight see and stuff myself with food. What is your favorite band? I love listening to Rock. What is your professional and military background? Aircraft mechanic for 12 years in the Navy. After two weeks on the job what do you like most about it? I really like the family atmosphere. What is your favorite type of food? Hawaiian and fruits. If you could go anywhere in the world where would it be? That would be where ever my family is happy. What is your favorite band? Old school R&B.